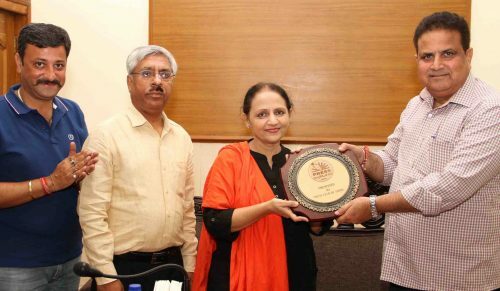 Jammu, Sep 16: Press Club of Jammu today felicitated ‘Nightingale of Jammu and Kashmir’ Seema Sehgal in a function organized here. Seema Sehgal, who was in the town to participate in a weeklong programme on Kunwar Viyogi rganized here by ‘The Kunwar Viyogi Memorial Trust, was felicitated by the Press Club of Jammu. In his welcome address, Secretary General Zorawar Singh Jamwal said the Press Club is feeling honoured by felicitating the daughter of soil like Seema Sehgal. Vice President Abhimanyu Sharma said Seema Sehgal started singing at the tender age of 8 and with her dint of hardwork and dedication, she was awarded A+ Grade at the age of 13 which is a rare achievement, Sharma said , adding her first Gramophone Disc was released at the age of 17. She has participated in over 500 concerts across India and is a famous name in Pakistan. She also performed on the lyrics o Yash Sharma, Ved Pal Deep, Kehar Singh Madhukar and Mehkoash Kashmiri. In her address, Seema Sehgal said Dogri is a language which needs no introduction. Stressing on the promotion of the regional languages in a big way, Seema Sehgal called for collective efforts for giving fillip to Dogri language. Every language has its own history and relevance and therefore endeavours should be made to preserve the composite culture and languages of the State, she said. Despite living in Mumbai from last many years, she has been speaking Dogri wherever she gets an opportunity, she said. She called upon the people of Jammu to speak Dogri with children. She would continue to perform in Dogri concerts for the promotion of Dogri language, she said. PCJ president Ashwani Kumar said Seema Sehgal has many achievements to her credit and has brought laurels for State of Jammu and Kashmir. Ravinder Koul conducted the proceedings of the programme.